The displayed green area ends on the road around 2 metres behind the vehicle. Safe distance: area up to approximately 40 cm on the road behind the vehicle. Projection of the vehicle (widened somewhat) toward the rear. The middle markers are approximately one metre behind the vehicle on the pavement. Position the vehicle in front of a parking space and engage reverse gear. 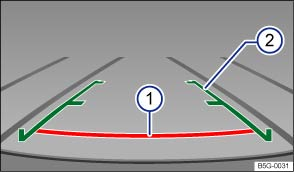 Reverse slowly and steer the vehicle so that the green orientation lines lead into the parking space . Position the vehicle in the parking space so that the green orientation lines are parallel to the parking space. 1) All references to the length of orientation lines apply to a vehicle that is standing on a horizontal surface.